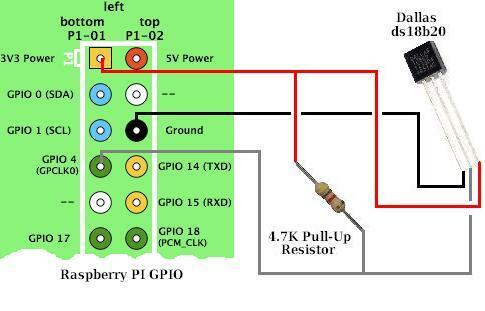 The Raspberry Pi does not have any ADC (analogue to digital converter) pins in its GPIO, and so a digital temperature sensor should be used. 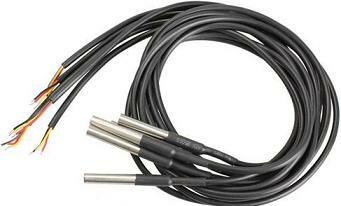 The sensor of choice around the world is the Dallas DS18B20 1-Wire temperature sensor pictured above. They are relatively cheap, very easy to find, easy to use, and supply readings accurate to +/-0.5 degrees across the range -10 to +85 degrees Celcius. to load in the 1-wire communication device kernal modules required to use the temperature sensor. Since the Raspbian operating system was updated back at the end of January 2015 (kernel 3.18.8 and higher) which enabled Device Tree, the above steps do not result in the temperature sensor(s) being detected. Finally reboot the Raspberry Pi so that the changes take effect. to see a list of the devices currently connected to your Raspberry Pi. Your temperature sensor will appear with an address in the format 28-00000xxxxxx. Below you can see that our temperature sensor address was 28-00000283c6cd. Each DS18B20 temperature sensor has a unique hard-coded address so that you can connect up multiple temperature sensors when required and still read them individually. Above we can see that the output from this command is two lines of data. At the end of the second line after “t=” is a numerical value. This value is 1000 times the temperature of the sensor in degrees Celcius. Therefore in our example where we see t=24812, the temperature readings was 24812/1000=24.812 degrees Celcius. Without going into great detail (click here if you want to learn Python), once per second this script reads in the temperature sensor file, gets the second line, splits it into its space-delimited elements, gets the tenth of these elements (denominated ‘9’ since ‘0’ is the first element), dumps the first two characters (“t=”) of this element, and turns what remains (24812 in our example) from a string into a numerical value which is then divided by 1000 to give us the temperature which is then printed to the screen. The above screenshot shows the script running while the temperature sensor is being held causing it to warm it up. If you would like to connect more than one temperature sensor to your Raspberry Pi, then click here to read our article Connect Multiple Temperature Sensors with Raspberry Pi. Instead of writing a Python script to get the temperature reading from the sensor, it is possible to write a one line command which will read the sensor, extract the temperature from the rest of the returned data, and process the result using Bash on the Raspberry Pi command line. The pipe character “|” is used to pass the output from one command into the next command. The script above first reads in the temperature from the sensor as before returning the two lines of data, the last part of the second line of which is t=XXXXX where XXXXX is the temperature in millidegrees Celcius. We then use sed to find this ‘word’ beginning with ‘t=’ in the data and then pipe it to a second sedcommand which strips off the ‘t=’. Finally the numerical result is piped through to an Awk command which divides it by 1000 and displays the temperature in degrees Celcius. so that whenever you type in checktemp at the prompt, the commands will be run. Now when you type in checktemp at the command prompt, your shell script will be run and the temperature reading from the sensor will be displayed. DS18B20 temperature sensors are available as bare components shown at the top of this article, but now, as shown above, it is possible to purchase warterproof DS18B20 sensors – DS18B20 sensors fitted into stainless steel tubine filled with epoxy and with a decent length of cable attached. The set of five shown above for example were available for just £6.53 including air mail delivery from Hong Kong. 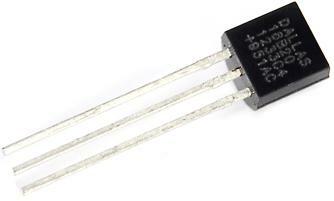 Click here for links to purchase Waterproof DS18B20 Temperature Sensors, or here for the bare component DS18B20 sensors. Click here to find out how to turn your Raspberry Pi and DS18B20 into a Raspberry Pi Temperature Data Logger so you can view your temperature data from anywhere in the world over the internet.